What do these things have to do with each other? 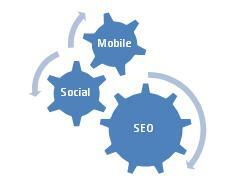 Simply put; Social Media and Mobile Applications are affecting Search Engine Optimization. Think of Google as a “Content Eating Monster” and Google loves to “eat” social media generated content. Google also indexes certain Social Media content. For example, did you know that Google looks at your Twitter Authority? The more “Klout” you have, the more authority Google gives your Tweets and Re-Tweets. Also, when someone of a higher authority than you, re-tweets your tweet, then you get a little boost in your authority. Google also likes LinkedIn, such as the three websites you can reference on your profile, especially when you customize their names or “anchor text.” These three websites are looked at as “do follow” by Google and they help your Google ranking. One other tip about LinkedIn, make sure someone completes the information on products and services on your LinkedIn company profile. Like any new technology, there will be those who drag their feet. For the rest of us, we need to be figuring out how we can make use of this change. Have you looked at “Responsive Web Design ?“ This strategy for website design allows the website to automatically adjust to screen size and resizes the images and content of the website to fit any screen size. Responsive Web Design may be enough for your organization or you may need a custom developed App. Either strategy will help your customers, employees and channel partners communicate more effectively through their mobile device. information. Every day, more searches are being done on a mobile device instead of a personal computer. Some advertisers are shifting from Pay-per-click to Pay-per-call; they only pay for the Ad when a customer clicks on their phone number to call from their smart phone. The adjacent model describes how social media and mobile apps work to enhance search engine optimization. I look forward to hearing your thoughts on the convergence of these three related technologies. 10-11-11 Social,Mobile & SEO – What’s Love Got to Do with Them?